I am a VERY big fan of Harry Potter. Big, BIG fan! When I heard several years ago that they were opening up a Wizarding World of Harry Potter theme park, I was over the moon! It has long been on my bucket list that I wanted to go there. I don't live close to Florida at ALL so it would be quite the ordeal to make that a vacation and I know it's definitely never been at the top of my husband's list so who knows how many years it would have taken to get down there. However, you may be aware that they are actually opening a new Wizarding World of Harry Potter them park here in California on April 6th !!!! Wahooooo! I think it will still be a while before I get to go there but it is way more likely that I will get to go sooner rather than later so I am so dang excited! That, and with the recent death of our beloved Alan Rickman, my mind has definitely been on all things Harry Potter a lot lately. My oldest child is only 4 years old, so I think that is a little too young to start reading the books with her, but I am really looking forward to the day when I can read these wonderful books with my kids. I have seen the cutest ideas lately for things to do at a Harry Potter party so I thought I would share them with you. It would be perfect for a birthday or just a fun day to have with your kids and/or their friends if you have been reading the books with them. Something really cute and fun you can do with the kids as a craft and party is to make wands out of bamboo and hot glue. Buy a bamboo pole and use a handsaw to cut your bamboo poles down to various lengths of 9″-12″. Remember that bamboo is not hollow all the way through, and every time there is a "bump" in the bamboo that joins sections, that part will be solid. So plan your cuts so that you will be able to add a core later. I cut mine so that the bumps fell at about 1/3 from the bottom of the wand. It makes a great, natural point for the handle. Seal off the bottom (handle-end) of your bamboo stick with lightweight spackling (the stuff you use to patch holes in your walls). You can apply it with a craft popsicle stick or just use your finger. Allow to air dry for at least 15 minutes. 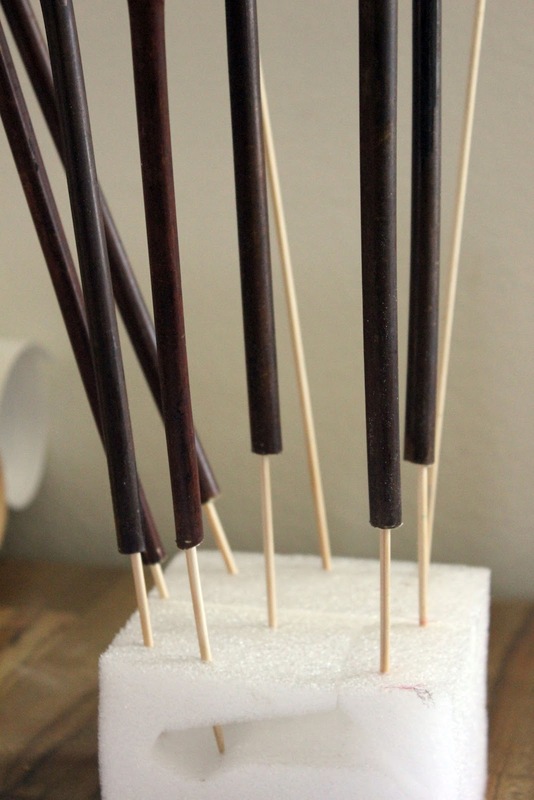 Meanwhile, set up your drying rack by pushing bamboo skewers into a block of styrofoam, and heat up your hot glue gun. Use hot glue to create handle designs on your wands. Squiggles, swirls, stripes, dots. . . play! Place each wand on a bamboo skewer to set. 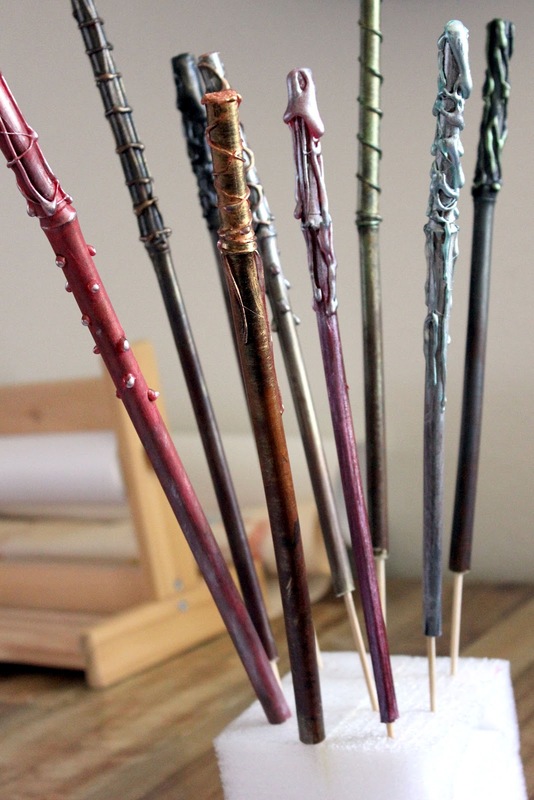 After the hot glue has dried, paint the wands with acrylic paint. It looks really cool to do a base color and then do a contrasting color on your raised hot glue parts you did. If you really want to take it to the next level, you can have the kids fill the hollow center with "cores" (feathers, heartstrings, etc.). Then you can fill the bottom of the hole with either spackling or hot glue. They are ready to go! The kids absolutely LOVE making these! You can have the kids pretend they are in divination class and that when you pour them this drink, depending on the color that appears, that will predict their future. The process is simple. Well ahead of the party, paint a smudge of food coloring (I like Americolor gel food colorings) on the bottom of each cup and let dry. 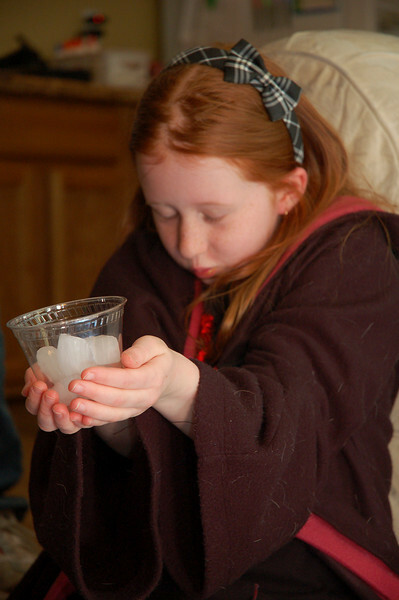 At the party, fill a cup with some ice (to cover the smudge of food coloring) and place it in a child's outstretched hands. Show them how to hold their hands out on front of themselves. It feels strange and mystical, and is the perfect misdirection to prevent them from having any chance of seeing the food coloring on the bottom of the cup. Have the child concentrate on their future, then add Sprite. The Sprite activates the food coloring at the bottom of the cup, and like magic, the child's future is revealed! That picture says a thousand words. They love this magical activity! And what Harry Potter party would be complete without Butterbeer in some form or another? 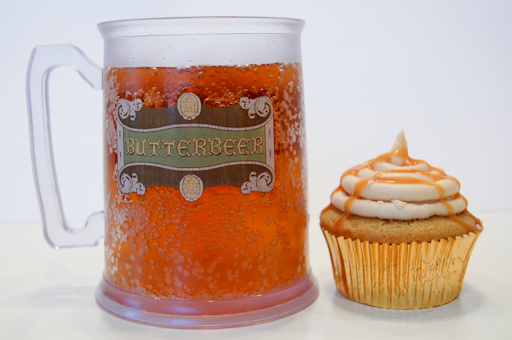 I have posted a recipe for Butterbeer and also the recipe for these butterbeer cupcakes that look delicious! Essentially, the flavor profile for these cupcakes is that of a buttery cream soda cake, filled with butterscotch ganache, topped with a butterscotch buttercream and drizzled with more butterscotch ganache. Heavenly! !